Alicante is a city located on the east coast of Spain. The city is the capital of the Alicante province in the south of the Valencian community. 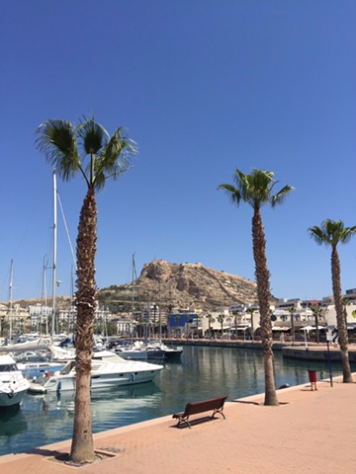 Alicante is both a coastal resort and a commercial port. Historically, Alicante has suffered from the majority of tourists landing in the local airport, and then heading north or south to other resorts. However, this is gradually changing, as Alicante has started to promote itself as a holiday destination. As of 2011, the city had 334, 329 inhabitants, making Alicante the second largest city in the Valencian community. Alicante benefits from a long summer season. The port harbours an increasing number of cruise ships throughout the summer, which brings a great deal of foreign visitors to the city centre, beach and promenade. Approximately 80,000 cruise passengers visit the city each year. Alicante has a highly regarded university on the northern outskirts of the city. The institution is attended by around 27,000 students. Alicante and the surrounding area benefits from a number of industries contributing to the local economy. The good weather and reasonable prices, ensure the city is an ideal getaway for a long weekend. Spain has traditionally been extremely popular with northern European tourists. This trend remains with an additional boost to visitors numbers provided by tourists from further afield, such as Russian and China. There are several well established industry sectors in the province of Alicante. The region is famous for amongst other things; marble, shoe making, toys and food produce. Alicante itself benefits greatly from the EU trademark and designs registry (UAMI) being based in the city. The organisation employs 1,200 made up of individuals from throughout Europe. This obviously provides a massive boost to the local economy. 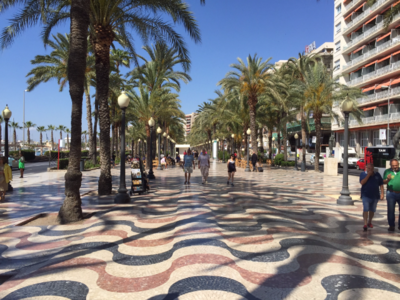 The Alicante city council reported that during the first quarter of 2015 the city registered 1,776 new businesses. This was the highest rate in Spain for this period. It is considered that an increase in tourism is the primary cause for the new investment. The centre of Alicante is pretty compact and you can walk from one side to the other within 20 minutes or so. The barrio of Centro encompasses the traditional centre of Alicante. Broadly speaking, this area stretches from La Rambla to Av. Dr. Gadea/Federico Soto and Alfonso Sabio to the promenade. The make up of Centro largely comprises small, boutique like shops, tapas bars, restaurants and pubs. The area is thriving, being busy during the day with workers and shoppers and a healthy leisure trade during the evenings. 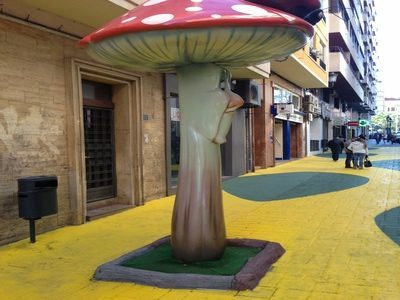 Calle San Franciso has been transformed following the installation of children’s characters in the street. This street has become a main pedestrian thoroughfare over the past 4 years and what was semi derelict, is now home to a range of small shops, tapas bars and restaurants. Calle Castaños has become a focus for the city’s nightlife with many bars, restaurants and terraces. La Rambla connects the promenade with Alfonso Sabio, another main street. La Rambla is generally very busy with tourists, particularly in the summer months. Ensanche is the newer area around Av. Maisonnave and running down to the seafront and up as far as Av. De la Estacion. This area includes the main shopping area, the new bus station and many bars and restaurants. Alicante benefits from two large El Corte Ingles department stores at either end of Av. Maisonnave. These stores are a big draw and ensures that Alicante’s shopping streets are continually busy. The Mercado area is centered around the traditional central market. The market is a popular tourist attraction, as well as a functional market for the local inhabitants. The indoor market mostly comprises meat, fish and fruit/vegetable stalls. 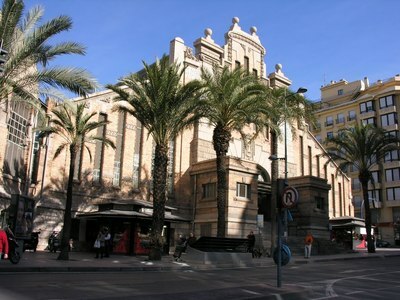 The market building itself is an impressive design and is a landmark in Alicante. The market is located directly on Alfonso Sabio. 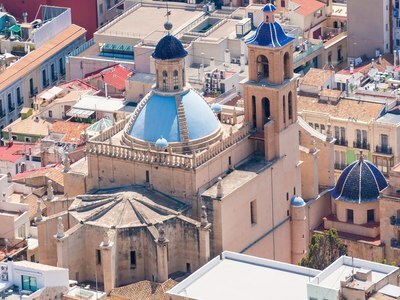 Alicante boasts a number of attractions as an alternative to spending lazy days on the beach. The castle, Castillo de Santa Barbara (http://www.castillodesantabarbara.com), overlooks the town and can be seen in most photographs and aerial shots of the city. There are several ways to visit with the castle being accessible by car, on foot or using the lift. The castle has a car park, which is accessed via Av. de Jamie II. The nearest tram stop for access is MARQ. Once you get off the tram there is a 10 minute walk up to the castle. There are two main footpaths on the city side of the castle, the first is at the end of Alfonso Sabio, near the Central Market. The other route takes you through the old town. This is the best way to visit the castle, although it is more leisurely coming down than going up. The least energetic route is to use the lift on the seafront. The entrance is opposite Postiguet beach, approximately half way along. There is a foot bridge across from the beach. There is a small charge for using the lift service. The castle offers amazing views of the city and is perfect for taking panoramic photos of the surrounding areas. There are frequent events held at the castle and various exhibitions throughout the year. The other main historical attraction is Lucentum archeological site located 3 km outside the city towards San Juan. Lucentum was the Roman settlement in the area and the museum has some impressive remains. The open air museum is not the easiest to find. The tram stop is Lucentum, but it might be best to take a taxi from the city centre. 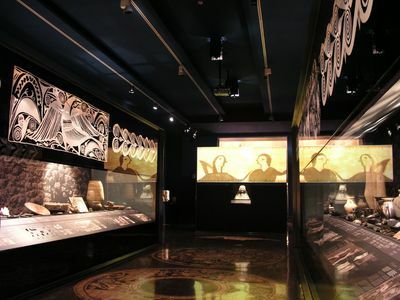 Another interesting museum is MARQ; Museo Arqueologico de Alicante (http://www.marqalicante.com). This museum is located inland from the castle. The tram stop nearby is named after the museum. The museum has been newly renovated and boasts an impressive collection of items from prehistoric, Roman times and the Middle Ages. The harbour and promenade areas are extremely well kept and obviously popular with visitors. A small boat service navigates around the harbour during the summer months. One of Alicante’s two casinos is located on the harbour side. To the rear you will find the Volvo Ocean Race Museum (http://museovolvooceanrace.esatur.com/index_en.html). This small museum is dedicated to the famous yacht race. Entry is free. 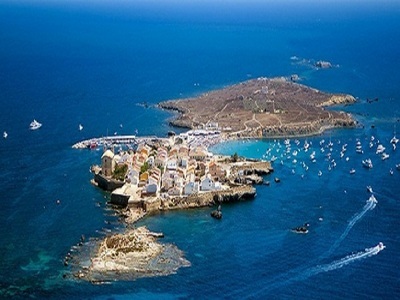 Also, in the harbour you can take a short boat ride to the nearby island of Tabarca (http://cruceroskontiki.com/en/). The journey takes around an hour. The small island is popular for it’s beach and snorkelling. It is worth pointing out that it can get extremely hot in the height of summer. There are a number of small restaurants on the island, the best of which are booked up in the summer months, so best to plan ahead if you want to eat there. Generally the restaurants overlooking the beach are to be avoided. Back in the centre of Alicante, you can spend an afternoon wandering the streets of the old town. 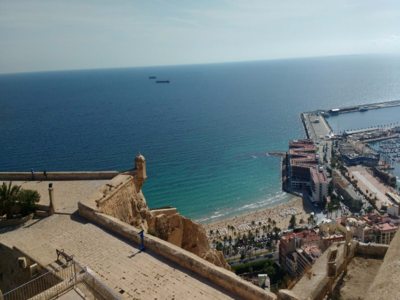 Alicante’s old town is by no means comparable with those found in some of the larger cities in Spain, but it is worth visiting its narrow streets. The area begins on the castle side of La Rambla. Amongst the streets of the old town you will find the Concatedral de San Nicolás, Basilica de Santa Maria, the Ayuntamiento (town hall) with its square, Museo de Arte Contemporáneo MACA and the water museum. If you head upwards towards the castle you will find the Barrio de Santa Cruz, a series of tiny streets with white washed properties. It is best to combine this walk with a visit to the castle. Many people take the lift up to the castle and then walk down through the old town. 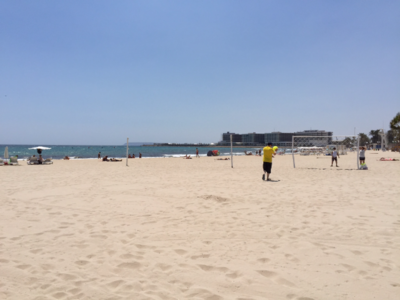 The beach closest to the town centre is called Playa Postiguet. It runs from beside the Melia hotel north towards San Juan. The beach is only around a kilometre long and can get very crowded in the peak season. There are a number of cafes and bars alongside the beach. At the far end you will find a very nice chiringuito (beach bar) which serves nice snacks and cocktails. If the beach is too busy then San Juan to the north of the city provides a long stretch of sandy beach or Urbanova beach on the way to the airport is usually much quieter. Not to everyone’s taste but Alicante also has a bull ring. It is still used several times per year for bull fighting. There is a small museum showcasing its history. The bull ring is also used for concerts from time to time. Alicante has a very nice little theatre (http://www.teatroprincipaldealicante.com/) in the centre of the city. There are various performances throughout the year and the building itself is very nice. 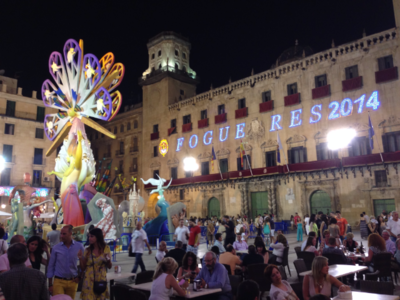 Like all cities in Spain, Alicante celebrates a number of festivals each year. The Easter period – Semana Santa – is a good time to visit. There are parades each evening along Alfonso Sabio, La Rambla, leading into the old town, and Cathedral. Bonfires are lit throughout the city on the last evening. Be prepared to get wet if you are watching nearby when the fireman control the fires! The town hall square is probably the busiest of the sites with bonfires. Hogueras is celebrated with many events throughout the city. Plaza Luceros is home to Las Mascletás; each day at 2.00pm during the festival loud firecrackers are set off. It is a loud and smokefilled spectacle. It gets extremely busy along Alfonso Sabio, Avenida de la Estacion and Av. General Marva and Federico Soto during Las Mascletás. During the week of the festival, street bars spring up and there are DJ booths at a few locations. The most popular being by the Plaza Calvo Sotelo and in Plaza Dr. Balmis. Bonfires are also lit on the beach. There is a museum dedicated to Hogueras on La Rambla. 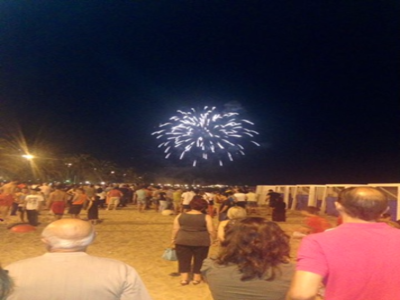 After Hogueras there are fireworks each night on Playa del Postiguet. It is run as a competition and the standard of display is very high. It is best to get there early. Another interesting event is the pilgrimage to Santa Faz. This is a walk to Santa Faz some 8 km away the route starts at the cathedral in Alicante and ends at the monastery in Santa Faz. Estimates suggest up to 200,000 revellers now make the trip, with street vendors along the way selling cold drinks. There is little shade along the way, so a hat and suncream is a must! Alicante now benefits from a wide choice of restaurants and bars with new openings occurring each month and the standards continually improving. In principle, it is best to avoid the tourist trap restaurants along the promenade and in particular, Calle Mayor and Plaza Santisima Faz. Some of our favourite restaurants are El Portal (http://www.elportaltaberna.com/). This is probably the most popular restaurant in the city at the present time. The standard is very good, and the prices reasonable considering the quality of the food. If you want a table you need to book in advance. Couples can usually find space at the bar to enjoy some of the tapas. The lunch menu contains specials and is very good value. Another popular, traditional restaurant is Nou Manolin, located just off Calle Castaños. The food and, in particular seafood, is very good. The restaurant is very large and there is also a ground floor bar area. La Taberna del Gourmet (http://latabernadelgourmet.com/) is located on Calle San Fernando, one street behind the promenade. The food is of very high standard. Booking is a must. The restaurant is part of a small group with a concession in El Corte Ingles and Tribeca burger bar (http://tribecamusicbar.com/) also under their umbrella. The newest upmarket restaurant in Alicante is Terre (http://grupomurri.com/en/restaurantes/terre/) located on the promenade. The restaurant offers modern Spanish cuisine in smart surroundings. Liberty Kitchen (https://www.facebook.com/libertykitchenalicante) is an American owned restaurant on Calle Poeta Quintana. The menu has an interesting blend of salads, burgers, ribs etc.. Only open Monday to Friday and best to book in advance. There are a number of ice cream shops (heladeria). About the best is Borgonesse (http://www.borgonesse.com/) at the bottom of La Rambla. They have an amazing selection of ice creams. In terms of nightlife, there are many bars that open up on Friday and Saturday nights in the old town. You will be amazed at the number of teenagers on the streets of the old town at 4am on a Saturday morning. Bars Austin and Nepal are popular bars with terraces on Calle San Isidro. There are also a number of bars on Plaza San Cristobal. The main street for having a drink outside is Calle Castaños. Castaños. Visit Nic (http://www.nicalicante.com/) for the best copas and cocktails in town. Other popular bars are Concerto, Historia, the Globe. There are many different bars and pubs in the surrounding streets. The Red Corner Sports Bar shows most European football and various other sports most nights of the week. Like many towns and cities in Spain, Alicante has adopted the habit of gathering at the Mercado Central on a Saturday afternoon to enjoy drinks and food then go on a bar crawl. This is known as Tardeo. The stall holders in the market have adapted to this by offering platters of jamon and cheese to take away along with bottles of beer. There are not many live music venues in Alicante. It is best to check the listings when you go. There is an annual jazz festival. Villavieja 6 on Calle Villavieja has music 3 or 4 nights per week. The beach bar on Playa Postiguet also has live music during the summer months. Late night bars/clubs of note are Confetti (http://www.confetticlassics.es/), Isla Marina (https://islamarina.wordpress.com/isla-marina/), Club Concerto (https://www.facebook.com/clubconcerto), Teatre (http://www.teatrealicante.com/) and Marmarela (http://www.marmarela.com/). Alicante has a nice mix of small independent retailers and the large chains. The main shopping street in Avenida Maisonnave. Here you will find two El Corte Ingles department stores along with all the major Spanish high street brands. The area between Plaza Calvo Sotelo and La Rambla has many boutique style shops. There are modern shopping centres outside of the city centre. The province of Alicante is particularly prominent in shoe making. Many manufacturers in the towns of Elche and Elda produce shoes for top international brands. Many of these companies have outlet shops, so a visit out of town is worthwhile if you are looking for a bargain. Alicante has a good choice of hotels and generally the prices are competitive. The only 5 Star hotel is the Hospes Amerigo (http://www.hospes.com/en/alicante-amerigo/) situated Calle Rafael Altamira. An alternative is the Melia (https://www.melia.com/en/hotels/spain/alicante/melia-alicante/index.html), overlooking the harbour and Playa Postiguet. There are a couple of reasonable 3 Star standard hotels which offer good value Abba Centrum (https://www.abbacentrumalicante.com/en/home.html) and Eurostars Lucentum (http://www.eurostarshotels.com/eurostars-lucentum.html). There is a choice of aparthotels which may better suit the needs of families: Barbara 3 (http://www.palaciohomes.es/en/barbara3/) and Apartamentos Poeta Quintana (http://www.alicanteflats.com/). The usual apartment websites such as Airbnb and Wimdu are also an option. Alicante boasts an international airport, located 9 km south of the city. The airport is the 5th busiest in Spain. In 2016 the airport handled over 12 million passengers. The airport is used by several low cost airlines. The majority of routes link Alicante with northern Europe. This reflects the visitor numbers from countries such as the UK, Ireland, Germany and Holland. Access to and from the airport is extremely efficient and cheap. The C6 bus service operates every 20 minutes and stops at multiple locations around the centre of the city. From the airport the bus follows the coastal road into the city. The bus runs on a continuous loop stopping at the new bus station, harbour area, MARQ museum, central market, Plaza Luceros, train station and then back out of the city to the airport. If you wish to get off for the train station, it may appear like the bus is going out of the city after the seafront stop, but stay on as it goes around the castle and back again. 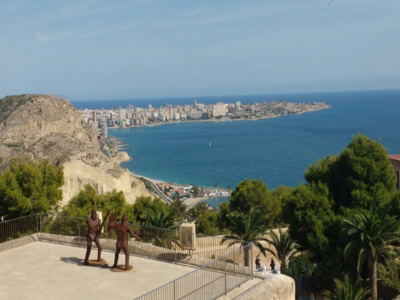 In summary, we think Alicante is an ideal destination for a few days break. The city is compact and offers something for everyone. Access from most of Europe is easy and cheap, as are food and drink prices.